We've always been able to send books and documents to multiple kindles on our accounts, and we can even send documents (reports, agendas etc) to other people's Kindles, but now there is an easier way for larger organizations to share books and docs. 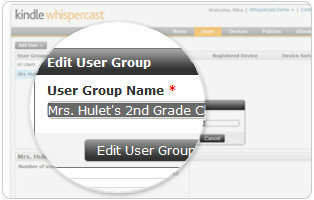 Schools and businesses can sign up for Whispercast. Your school or business can now extend the benefits of Kindle to its students, employees, or customers. Whether you’re looking to distribute literature for class or use Kindle for your corporate training or incentive program, Whispercast helps you reduce the administrative cost and complexity of sending Kindle content and managing your Kindles. Interested in purchasing Kindle for your organization? Visit Kindle: Business and Education Sales to get a quote.